Japanese Episode DP 018: "Kurogane Gym, Again! A Decisive Battle with Rampard!!" American Episode 482: "O'er The Rampardos We Watched!" Satoshi's rematch at the Kurogane City Gym has begun! The first battle has Satoshi's Pikachu facing off against Hyouta's Iwaku. The rock snake pokemon seems to have the upper hand until Pikachu unleashes a powerful Thunderbolt attack that causes the debris it creates to hit Iwaku! After Iwaku is defeated, Hyouta calls out his Ishitsubute. Satoshi recalls Pikachu and fights with Aipom, and before long Hyouta's second pokemon is defeated. Satoshi's three pokemon seem confident that they'll be able to defeat Hyouta's Rampard, but the Gym Leader's pokemon is able to take out Satoshi's Aipom with a single attack! Satoshi calls his Pikachu out, and while it is able to weaken Rampard with an Iron Tail attack, it too is defeated by the Gym Leader's pokemon. The final match of the Kurogane City Gym is Hyouta's Rampard against Satoshi's Naetle. Naetle tries to use its Razor Leaf attacks to damage Rampard, but its attacks are deflected by Rampard's Flamethrower. In order to get close enough to hit Rampard, Naetle is ordered to continue using Razor Leaf. The charred remains of the leaves that Rampard leaves behind creates a camouflage that enables Naetle to sneak up on its opponent and deliver a powerful Razor Leaf! 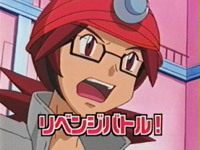 With all three of Hyouta's pokemon defeated, Satoshi is named the victor! With a Coal Badge in his hand, Satoshi thinks ahead to the remaining seven Gym Leader challenges that await him. The four part arc Kurogane Gym arc comes to an end with this episode, and overall, I'm satisfied with the way everything turned out. It seems the writers have finally figured out how to make a Gym Battle exciting and down-to-the-wire without making everything eye rolling-ly impossible, and I couldn't be happier. If the rest of the Gym Battles in this region are this good, then I think it'll be safe to say that Diamond & Pearl is the best story arc yet. The dubbed version only keeps six pieces of music...was "A Gruff Act To Follow!" a one-time thing or what? Also, the scene with Gureggru staring down the Rocket-Dan works sooooooo much better without music than it does in PUSA's version of the scene. At the end of the battle, the Japanese version plays an extended version of the opening theme, Together. In the dub, PUSA sort of tries to match what the Japanese version did by playing their own opening theme during the same scenes. While PUSA's intentions are nice, the execution of the thing is awful. Rather than create an extended version of their opening theme, they just sort of awkwardly loop through TV version of the song four times. Y'know how, if you leave a DVD menu on long enough, the song that's playing in the background will stop and then go back to the beginning? That's what watching the English version of the last part of this battle was like. PUSA's made quite a few random songs during Battle Frontier, so there's no reason to assume that they couldn't have written an extra verse or two for a song that's already there. Lazy lazy lazy. Der TO BE CONTINUED Schirm ist drei Sekunden länger in der englischen Version, als er in der ursprünglichen Version ist.